Poor weather over the Pacific Ocean forced military officials to put off the planned Wednesday launch of a hypersonic glider from Vandenberg Air Force Base in California. 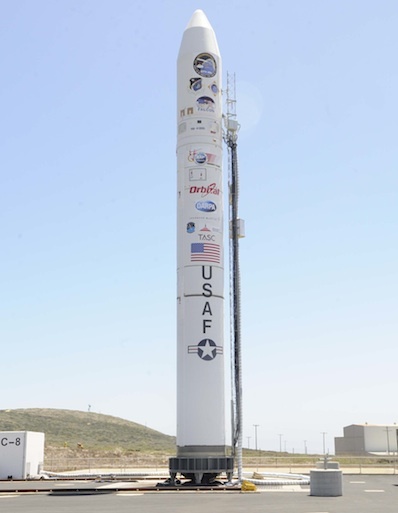 The mission was scrubbed because of inclement weather conditions downrange west of Vandenberg, the nation's primary West Coast launch site located between San Francisco and Los Angeles. Bad weather was reported near Kwajalein Atoll, the remote destination for the mission's high-speed flight demonstrator. After conducting maneuvers over the Pacific Ocean, the arrowhead-shaped vehicle is supposed to fall back to Earth near the U.S. Army's Reagan Test Site near Kwajalein in the Marshall Islands. Liftoff is rescheduled for 7 a.m. Pacific time (10 a.m. EDT; 1400 GMT) Thursday aboard a three-stage Minotaur 4 Lite launch vehicle, according to the U.S. Air Force. The launch could occur from 7 a.m. through 1 p.m. local time. 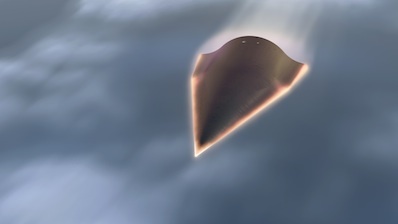 The mission's goal is to demonstrate hypersonic gliding and maneuvering techniques at the edge of space at speeds eclipsing 13,000 mph. The test flight could help the Pentagon develop a prompt global strike program to deliver conventional warheads to faraway targets in less than an hour. It is the second flight of the military's Hypersonic Test Vehicle 2, a craft built by Lockheed Martin Corp. for the Defense Advanced Research Projects Agency, or DARPA. An initial demo flight in April 2010 ended prematurely when the HTV lost control and had to be destroyed. Engineers concluded the anomaly was due to flight control authority limitations when the vehicle's flaps were unable to maintain the HTV's orientation. Despite the abridged flight, last year's test gathered 139 seconds of useful aerodynamic data and verified navigation, communications and control systems. The taste of data from the shortened first HTV flight was still more than could have been efficiently collected inside wind tunnels on the ground, according to Air Force Maj. Chris Schulz, the HTV 2 program manager. Wind tunnels are able to simulate long-term hypersonic flight conditions up to velocities around Mach 15. Beyond that, engineers need special wind tunnels called impulse tunnels to capture data milliseconds at a time. It would have required years, tens of millions of dollars and several hundred impulse tunnel tests to replicate data from the April 2010 demo flight. "And even then, we wouldn't know exactly what to expect based solely on the snapshots provided in ground testing," Schulz said. "Only flight testing reveals the harsh and uncertain reality." The second craft has a different center of gravity, it will fly with a reduced angle of attack, and it will use thruster jets to help control itself in flight, according to DARPA, the military's research and development unit. "DARPA looks forward to conquering more unknowns about long-duration hypersonic missions," said Dave Neyland, director of DARPA's tactical technology office. "We need to increase our technical knowledge to support future hypersonic technology development. We gained valuable data from the first flight, made some adjustments based on the findings of an engineering review board to improve this second flight, and now we're ready to put all of that to the test." About three minutes after launch, the Minotaur rocket should accelerate the HTV payload to about 20 times the speed of sound, fast enough to travel from New York to Los Angeles in 12 minutes. Once the glider is released, it will first prepare to re-enter Earth's atmosphere, then soar through the edge of space with a series of programmed banks to control the craft's speed and trajectory. Temperatures outside the vehicle will reach 3,500 degrees Fahrenheit during the most extreme part of the flight, hot enough to melt steel. Tracking ships, planes and space assets will collect data during the flight, and the HTV is covered in sensors to study how the vehicle responds throughout the mission. At the end of the mission, the HTV will dive into the ocean and will not be recovered. DARPA says the HTV craft features a high lift-to-drag aerodynamic shape, lightweight thermal protection structures and autonomous guidance, control and flight safety systems. This pair of HTV tests is part of DARPA's Falcon project. An Air Force-led follow-on flight called the Conventional Strike Missile is planned launch on another Minotaur rocket in mid-2013, in which another HTV will be outfitted with a conventional warhead to be directed toward a target downrange.